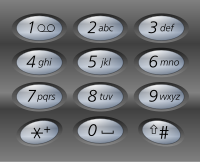 A mapping of digit to letters (just like on the telephone buttons) is given below. Input:Digit string "23" Output: ["ad", "ae", "af", "bd", "be", "bf", "cd", "ce", "cf"]. It’s a easy question. But we can do it both in recursive way and iterative way. In the iterative way, we use the result from the previous digits, and then add new letters to them. Assuming the average number of letters on every number is m, and the length of digits string is n, then the complexity is O(mn).